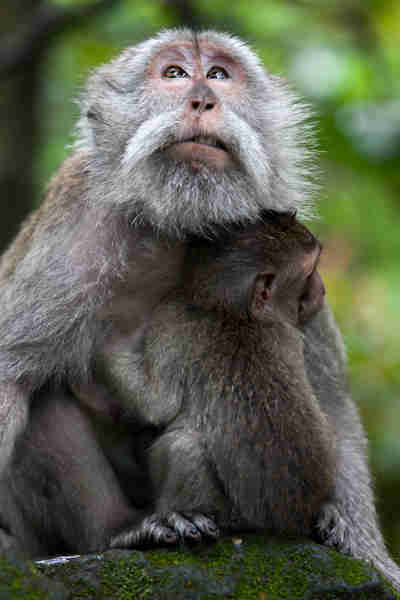 Top photo: A mother macaque grooms one of her offspring in the Sacred Monkey Forest in Ubud, Bali. 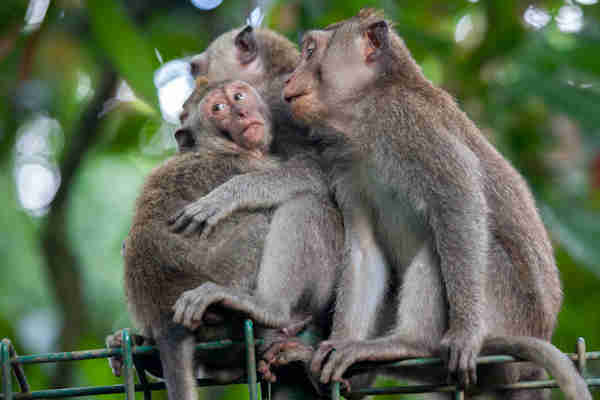 Watching the macaque monkeys in the Sacred Monkey Forest in Ubud, Bali, I found myself mesmerized by their expressive faces and extraordinarily human interactions. 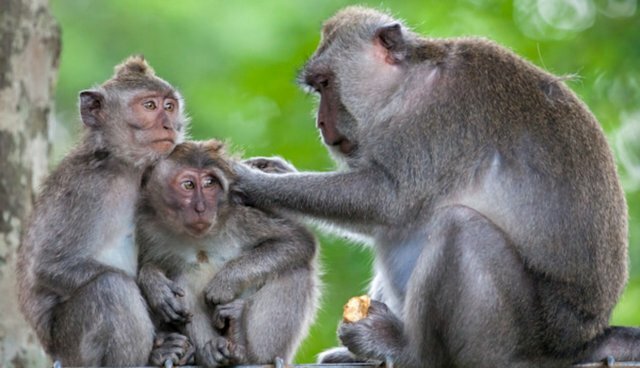 I watched a mother macaque gently chastise her teenager when he pulled away from her grooming, two adults squabble over a banana, an infant peeking anxiously from underneath its mother's belly and siblings huddling together in mutual protest of their mother's grooming. 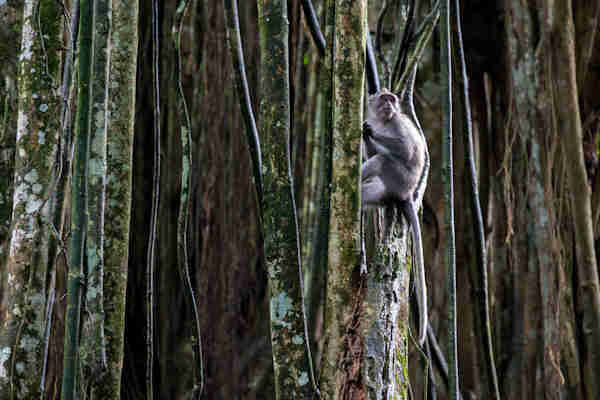 After hours and hours of watching and photographing the macaques, I was left with the impression that, like us, macaques have a complex social structure and their interactions are fraught with meaning. After doing a bit of research, I discovered some interesting facts. 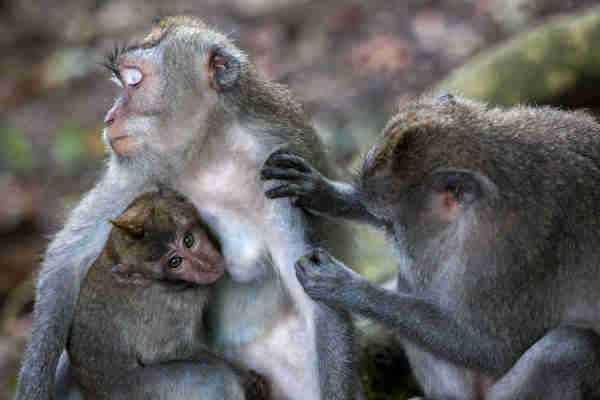 For instance, the amount of time a female spends grooming a male signifies his social hierarchy, a female will solicit a male by presenting her swollen behind to him, looking back at him and smacking her lips together and young females will, under the supervision of a mother, carry infant macaques as a way of practicing for motherhood. This all sounds quite familiar. 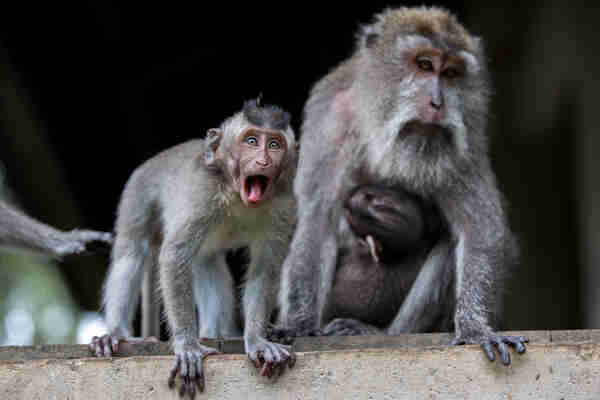 It did not surprise me to discover that monkeys play a complex role in Balinese society. Like humans, they can embody both good and evil and this is reflected in the cultural narratives one sees in Balinese dance and theater. While on one hand, monkeys are revered and protected by the Balinese because they are believed to guard temples from evil spirits (hence their protected status in such religious sites as the Sacred Monkey Forest which houses several important Hindu temples), they are also seen as a menace because they raid rice paddies and are famous for their thievery (often stealing bags, cell phones and other objects from tourists or items from shops). 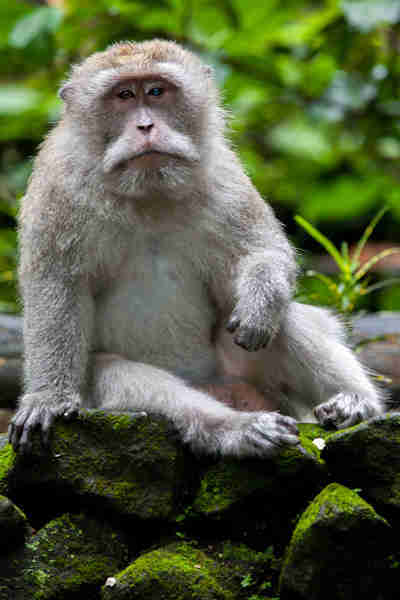 Perhaps too the Balinese see themselves reflected in the monkey and recognize their own fallibility. On my way out of the monkey forest, I noticed how many tourists, like me, could not draw themselves away from the macaques. Perhaps they too were mesmerized by the mirror held up before them - a perfect image of the gentle, loving, complex and sometimes frail bonds that connect us.